Have a few questions? Most people do. So, here’s a quick collection of some of the common questions I get… with my answers next to them. If you still have a question don’t hesitate to shoot me an email through my contact page (or give me a call). Q: Are you actually listing my Sacramento house on the MLS or buying it? A: Great question. I’m not an agent, and I don’t list houses. I buy houses that fit my buying criteria. From there I may repair the house and resell it to another home owner or keep it as a rental. A: I have to purchase a house below market value so I can resell it at a profit to another home owner. However, if you’re in foreclosure you likely don’t have equity… so I can often negotiate with the lender for a discount on the property. In the end, I have to get a fair discount on a property so I have room to make a profit when I resell it. But, I bring to the table a fast, no hassle, all-cash offer… I can close quickly, am very flexible on terms of the sale, and will buy your house in any condition. If thats what you’re looking for and you see the value in getting your house sold fast… lets talk and see if we can come to a fair win-win price. Q: How do you determine the price to offer on my Sacramento house? A: Great question and I’m an open book… so I’m glad you asked. My process is rather simple. I look at the location, what repairs are needed, condition, and values of comparable houses sold in the area recently. As you know, house values have taken a huge hit in the last 5 years and most areas still haven’t seen prices come back up. So, I take everything into consideration… and come up with a fair price that works for me and works for you too. A: There are NO fees or commissions to work with me. I’ll make you an offer, and if its a fit… I’ll buy your house (and I’ll often pay for the closing costs too!). No hassle. No fees. I make my money after I pay for repairs on the house (if any) to fix it up so it’s nice and pretty… market the house, and sell it for a profit (I’m taking all of the risk here on whether I can sell it for a profit or not, once I buy the house from you… the responsibility is mine and you walk away without the burden of the property and it’s payments… and oftentimes with cash in your hand). A: Real estate agents list properties and hope that someone will buy them. The average time to sell a property in many markets right now is 6-12 months. As you know, you pay a commission as a % of the sales price when you work with a real estate agent. Often times it’s 3-6% of the sales price (so if it’s a $100,000 house, you’ll pay between $3,000 – $6,000 in commissions to an agent). Agents provide a great service for those that can wait 6-12 months in many cases to sell and who have room to pay the commission on the sale. I actually buys houses. I don’t list houses. Since I’m actually the one buying the house from you, and I pay with all cash… I can make a decision to buy your house within a couple days (sometimes the same day). Again, I make my living by taking the risk to buy the house with my own cash, repair the house, and market it myself to find a buyer (which is the hard part in this market). A: No obligation at all. Once you tell me a bit about your property, I’ll take a look at things, maybe set up a call with you to find out a bit more, and make you an all-cash offer thats fair for you and fair for me. From there, it’s 100% your decision on whether or not you’d like to sell your house to me… and I won’t hassle you, won’t harass you… it’s 100% your decision and I’ll let you decide what’s right for you. Need more information on the foreclosure process and How To Stop Foreclosure? 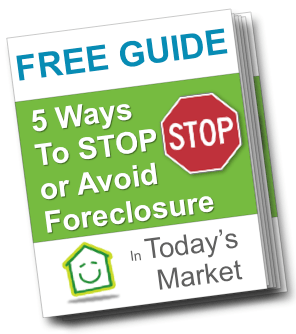 Download my FREE Stop Foreclosure Guide here. Or, you can always feel free to Contact me anytime if you have questions, want a no hassle Situation Evaluation, or want to just learn more about how I can help homeowners avoid foreclosure or sell unwanted properties for cash.